The history of shipbuilding dates back thousands of years, while the first tanker was built only in 1877. 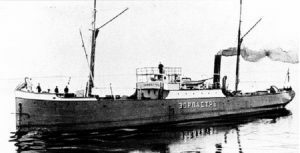 The deadweight of M/T “Zoroaster” was only 250 tons and she was employed to transport kerosene in bulk from Baku to Volgograd (then Tsaritsyn). The key to such historical gap is in the unsolved engineering problem. Large volume of liquid in a hold affected the stability of a vessel. As a result, liquids were transported in barrels almost to the end of the 19th century. Moreover, there were no efficient pumps; and wooden hulls inhibited normal storage of liquid cargo. Meanwhile, with the advent of steel vessels, division of the hull into separate tanks and invention of modern pumping systems the new industry was born. Now tankers are the most popular and profitable way to transport liquid cargoes. For example, according to U.S. Energy Information Administration more than 60% of all world crude oil is carried by sea. According to Statista.com more than 7,000 oil tankers operate in the ocean today. Most of them are crude oil carriers. Tankers for transportation of crude oil and petroleum products with a flashpoint below 60 °C (140 °F) and a vapor pressure below atmospheric. Tankers for the transport of petroleum products with a flash point above 60 °C (140 °F). With regards to size, crude oil tankers also dominate. Oil Product Tankers that carry gasoline and other petroleum products usually have modester dimensions. (1.8 – 4.9 m gallons) Low-tonnage general purpose tankers. Often used to transport bitumen. (4.9 – 7.5 m gallons) General purpose tankers. Mostly small tankers for petroleum products. (7.5 – 13.5 m gallons) Medium tonnage tankers. Used as both crude oil and product tankers in small waterways. (13.5 – 24 m gallons) Large Range Class 1 tankers. These are employed for transporting crude oil and heavy oil products. (24 – 48 m gallons) Large Range Class 2 tankers. (48 – 96 m gallons) Class 3 large tankers transport crude oil from production sites to refineries. 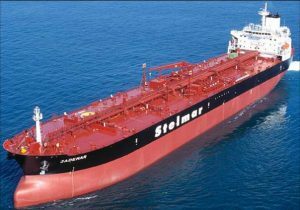 (above 96 m gallons) Also known as Supertankers. Carry crude oil over long distances. For example, from the Persian Gulf to refineries in America or Asia. (above 96 m gallons) These are Supertankers whish has been re-built or specially designed as floating oil terminals. Developed oil is stored at sea and transferred to smaller tankers. FSO ASIA is the largest such vessel in existence. Her DWT is 441,893 tons and she operates in the Persian Gulf at the moment. Seawaymax: These tankers can fit through a narrow system of locks of the St. Lawrence Seaway (a 2500-km-long (1553 ml) sea channel connecting the Atlantic Ocean with the Great Lakes in the USA). The maximum deadweight of a vessel passing by this route must not exceed 28,500 tons, length – 225.6 m (740 feet), width – 23.8 m (78 feet), draft – 8.1 m (8.08 m). The reality is that only 10% of ordinary seagoing vessels can pass all 14 canal locks up to Lake Superior. Therefore, navigation is mainly carried out by special vessels built for this region. Panamax: Dimensions of tankers in this category are limited by the size of the Panama Canal. The New Panamax Project aimed at expanding the narrowest channel cameras was completed in 2016. Now Canal can accommodate vessels with the length reaching 336 meters (1102 feet), a width of up to 49 m (161 f) and a draft of up to 18.3 m (59 feet). These impressive metrics replaced earlier 294 m (965 f), 32.2 m (105 f) and 12.6 m (43 f) earlier allowed dimensions. This is especially good news for LPG-carriers going from the USA to Asia. According to DNV GL analytics, as of the end of 2017, 100% of all American NEO-Panamax gas carriers passed through the canal. Moreover, the Panamanian authorities have achieved a good speed of passing ships – 5.9 tankers per day. Aframax: The term derives from the name of the Average Freight Rate Assessment (AFRA) system created by Shell Oil in 1954. Aframax tanker dimensions are usually up to 120,000 DWT, length – 253 m (830 f), width – 44.2 m (144 f). This is the most popular type of tanker at the moment. Armed with their compact dimensions they can work in most marine terminals of Northern, Black, Mediterranean, Caribbean seas; while their big capacity allows economizing on oil transit. Suezmax: The next common category of vessels is focused on the passage of the Suez Canal. After numerous expansions, it is able to fit vessels with deadweight of up to 200,000 tons, a maximum draft of 20.1 m (66 f) with a width of 50 m (164 f) or a draft of 12.2 m (66 f) and a width of 77.5 m (253 f). Suezmax tankers are widely used around the world, especially in West Africa, the Black Sea, Persian and Mexican Gulfs. 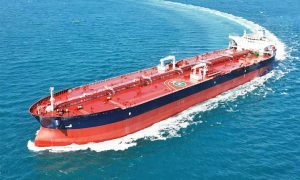 In addition, experts give this niche a favorable outlook for 2019 in contrast to the larger VLCC tankers. By the 4th quarter of 2018 the revenue in the Suezmax category surpassed $ 23,000 per day; and the demand for these tankers would only rise during 2019 due to the swelling oil production in the United States. VLCC: Large tonnage crude oil tankers (Very Large Crude Carrier) are also called Malaccamax tankers named after the Strait Malacca, the main route connecting the Indian and Pacific Oceans. VLCC dimensions are limited only by the minimum depth of the strait – 25 m (82 f). Therefore, the draft in this category does not exceed 20 m (66 f). The tanker deadweight is from 200,000 to 320,000 tons, the length is 330 m (1083 f), and the width is 60 m (197 f). VLCCs are common in the regions of oil production such as the Middle East or West Africa. They transport crude oil to large buyers over long distances. The limitation of production by OPEC countries led to a crisis in the market of large-tonnage tankers. The Bloomberg agency reported the whole cluster of empty VLCC tankers in the Atlantic Ocean in February 2019. ULCC: Ultra-large crude carriers (Ultra Large Crude Carrier), also known as Supertankers, have deadweight of 320,000 to 550,000 tons, a length of 415m (1362 f), a width of 63m (207 f) and a draft of more than 35m (115 f). Such vessels require special terminals and usually transport oil from the Persian Gulf to major ports of Asia, America and the Northern Europe. M/T Knock Nevis is the largest oil tanker in history, built in 1979 in Japan. Its deadweight was 564.763 tons and length – 458 meters (1503 f). 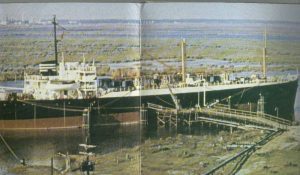 The tanker sunk during the Iran-Iraq conflict, but was restored later and continued operation. Scrapped in 2010. Mega yacht based on the tanker. 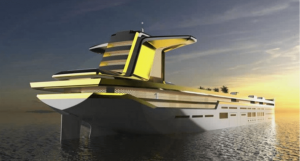 The Austrian design bureau MOTION Code: BLUE recently presented the revolutionary design of a superyacht based on the Suezmax tanker. The concept is called “Imara”. It has a length of 280 meters (919 f), so there is enough space for several helidecks, a garden of palm trees, a concert hall, bars, terraces, numerous apartments. The owners and guests of the superyacht will saunter along the decks in spherical electric cars. The Game Changing Accident. The disaster that transformed the world of oil transportation happened on March 24, 1989 when M/T Exxon Valdez grounded in Alaska. The hull was ripped open; and 144,000 tons (43 m gallons) of oil spilled into pristine waters of Prince William’s Strait. The consequences of this environmental disaster have been observed over the next 25 years. Meanwhile, shipping industry responded by adoption of the Oil Pollution Act 1990 which has a huge effect on the operation of modern tankers. The Black Gold Project. There is a project with such alluring name in the countries of the Persian Gulf. The Black Gold Project involves transformation of an old oil tanker into a multifunctional complex with business and entertainment centers. The tanker will be moored off the coast and a promenade will pass through it. The Recent Big Accident. 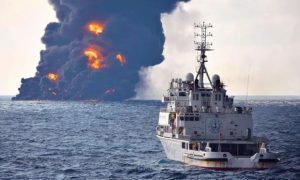 Despite all the precautions, incidents with oil tankers are still inevitable. The last big tragedy happened only recently, in January 2018. The Iranian tanker M/T Sanchi were on her way to South Korea with a cargo of light oil (136,000 tons or 41 m gallons) when she collided with a bulk carrier off the coast of China. The next day the vessel “suddenly” caught a fire throwing a kilometer high pillar of flame and smoke into the sky. There were 32 crew members on board, only three bodies subsequently were found. The public has criticized the Chinese authorities severely for their lack of efforts to save the crew and prevent environmental damage. The oil spill affected the main fishing areas of China, but was difficult to assess and eliminate. The light oil is transparent and merges with the surface of the water. At the same time, the oil slick of Sanchi’s fuel were 15 and 18 km long. 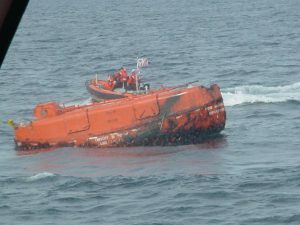 The tanker sank 8 days later. This is a special type of vessel designed to transport chemicals in liquid form without packaging. The history of chemical tankers dates back only 60 years. Initially, these were oil tankers built in the late 40s of the 20th century and rebuilt to transport vegetable oils and grease. The first purposefully built chemical tanker made its way from the Great Lakes to the Northern Europe in 1959. The construction of chemical tankers began in the 60s, but the real boom came the 70s with the rapid development of the chemical industry. This is the time when the double bottom structure, stainless steel tanks appear and technologies of coverage are improved. Cofferdam and modern cargo systems were introduced along this period either. New players – “Asian Tigers” appear in market in the 90s. The chemical industry of Southeast Asia brought shipowners from Thailand, Taiwan and South Korea to the market as well as diversified the geography of the routes. The fleet of tankers was also significantly updated during this decade. In the 21st century, the industry is developing against the background of strict environmental and tax restrictions. The market is controlled by a powerful oligopoly – 14 large companies control the bulk of the traffic. Coastal Chemical Tankers (Short Sea Tankers) – 3000 – 10,000 tons (ships for coastal navigation). These small chemical tankers appeared only in the 80s. It became expedient to build small vessels specifically for the transport chemical products. Deep Sea Chemical Tankers – 10,000 – 75,000 tons. The most common category of tankers nowadays. Type 1 – such tankers are designed for the carriage of goods representing the maximum danger to the human health and environment. Transportation of such cargo requires the most stringent measures to prevent leakage i.e. double-hull or bottom system in case of a collision or grounding of a tanker. There are few such super-dangerous goods in Chapter XVII of the IBC Code. For instance, these are such agents as chlorinated paraffin, chlorosulfonic acid (classified as chemical weapon), organic solvent dodecane, etc. As a result of so many precautions, Type 1 tankers are not as popular in the market as other categories. Type 2 – this type of tankers carry cargo that poses a serious threat to the environment and human health. Therefore, requires an adoption of significant protective measures to prevent leakage on board. This is the most commonly used type of chemical tanker. They transport everything from acids to alcohols and petroleum products. Tankers of the second type also have double hull. Type 3 – vessels of this type transport cargoes that are listed in Chapter XVII and present little danger to the environment and human health. Tank and hull structures require moderate precautionary measures. Therefore, one longitudinal bulkhead is sufficient for such tankers. These vessels are not equipped with double-hull structure, so are reserved for transportation of molasses, vegetable oils, glycerin and so on. 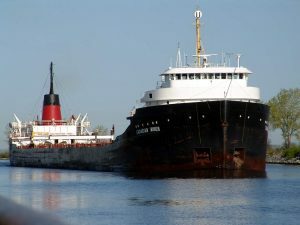 M / T Bow Mariner: The tragedy of Bow Mariner chemical tanker on February 28, 2004 killed 21 people. The Singapore flagged vessel was going from New York to Texas with a cargo of industrial alcohol and other chemicals on board. They were not far from the coast of Virginia when the captain for some inexplicable reason has ordered to open the lids of 22 tanks . As a result, combustible vapors were mixed with air and a fire occurred on the deck. Its causes are still unknown. The investigation considered different versions from a mechanical spark to smoking and sabotage. In any case, two powerful explosions occurred 2 minutes apart from each other. The tanker was severely damaged and sank after an hour and a half spilling out all 11,000 tons (3.4 m gallons) of technical alcohol, 730 tons of hydrofluoroolefine (dangerous refrigerant) and a fuel. As the expertise revealed later, it have not been only captain’s actions which led to the tragedy, but also the poor equipment of the vessel which had lacked rescue equipment severely. As a result, three crew members were officially pronounced dead; and 18 are still listed as missing. M / T levoli Sun: Another well-known shipwreck in the industry occurred due to the entirely different reasons. The vessel of the Italian shipowner was caught by a storm in the English Channel on October 30, 2000 near the island of Alderney. A strong wave swept the nose of chemical tanker; the vessel lost stability and drowned. There were 6000 tons (2 m gallons) of hazardous chemicals, incl. styrene (poisonous liquid for the production of plastic, foam and napalm), isopropanol (a polymer that is part of acetone), butanone(a powerful solvent) onboard of the 115 meter (377 f) tanker. Fortunately, thanks to the coordinated actions of the crew and costal services, human victims were avoided that time, but the ecological situation was complicated by the fact that all these substances did not dissolve in water. Currently, there are more than 5,000 chemical tankers in the ocean. Their number has increased by more than 2.5 times since 2008; and analysts predict this industry to continue active growth until 2025 due to the rapid development of the chemical industry around the world, high demand for vegetable oils and fats and slowdown in oil production as well as future fuel restrictions ( 2020 Sulfur Cap). LPG tankers that specialize in transporting such gases as butane, propane, butadiene, propylene, vinyl chloride monomer and even liquid ammonia; and LNG tankers carrying liquefied natural gas – methane and ethane. The history of the liquefied gases transportation has begun in 1929 when Shell temporary re-designed M/T Megara for LNG transit. Then, in the 30s M/T Angnita (DWT 4500 t) was built at Dutch shipyards. She could simultaneously carry crude oil, LNG and sulfuric acid in her tanks. However, the real birth date for the industry of liquefied gas shipping can be considered January the 25, 1959. Tanker M/T Methane Pioneer (DWT 5034) was specially re-built from a cargo ship and made its first journey from Louisiana to Convey Island in the UK. The project became commercially successful. So, Conch International Methane Ltd, inspired by the success of its first tanker, added 2 large (27,000 m3/954000 cu ft) and technically advanced LNG carriers to its fleet in the early 60s. Ships were working on gas shipments from Algeria to the UK at that time. In the 70s, gas tankers’ development was associated with the United States which exported gas from fields in Alaska to Japan. During this period the US government orders 16 major LNG carriers in the Swedish shipyards. This is the legendary time when gas carriers became 5 times bigger, modern design of cargo tanks was introduced (Moss Rosenberg cargo containment spherical system); and shipyards in Norway and South Korea joined the construction. In the 80s and 90s Australia, Qatar and Russia took over the gas export initiative. The need for “blue fuel” and production were growing, so, respectively, was the size of LNG carriers. In 1999 the Samsung Heavy Ind. built the largest and most expensive methane carrier in the world at that time. It can carry 138 378 m3 (4 876 772 cu ft) of gas, boasts a length of 279 m (915 ft) and is equipped with a new membrane tank system. But this record is already beaten. The Qatar – Max tankers project has been presented in 2003. These LNG carriers can carry up to 266,000 m3 (9 393 701 cu ft) of gas. The year 2018 was really lucrative for LNG carriers. According to the VesselsValue website, 65 new ships were launched with a total value of 11.6 billion US dollars. Meanwhile, the cargo capacity of the world fleet increased by 10.23 million m3 (361 269 040 cu ft). 17 657 – 211 888 cu ft Small fully pressurized gas carriers. They are used to carry propane, butane and ammonia at ambient temperatures. There are usually 2 cylindrical tanks at these vessels. 35 314 – 423 776 cu ft Gas carriers for the ethylene transportation. Gas is carried at atmospheric pressure, but cooled to -104°C (-155° F). 176 573 – 3 531 466 cu ft Fully refrigerated LPG carriers; such vessels are employed for transportation of liquefied petroleum gases at atmospheric pressure and temperature – 55 °C (-67°F). 1 412 586 – 4 590 906 cu ft Isolated methane carriers of large displacement. LNG is transported at atmospheric pressure and at a temperature of – 163°C (-261°F). 5 120 626 – 5 438 458 cu ft Conventional LNG carrier – general purpose methane carrier. 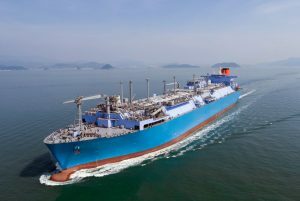 6 074 122 cu ft Yamalmax is a separate class of LNG carriers. Its dimensions are limited by the size of the approach channel of the port of Sabetta on the Yamal Peninsula. The maximum depth there is only 15 m (49 ft), so the leading vessel M / T Christophe de Margerie (named after the President of Total) has a draft of 13 m (43 ft), but carries 172,600 m3 (6 095 311 cu ft) of gas and boasts an impressive 299 m (981 ft) in length and 50 m (164 ft) in width. Vessels of this class can also go independently through compact Arctic ice with a thickness of up to 1.7 m (6.54 ft). 7 416 080 – 7 627 968 cu ft Q-Flex or Qatar-Flex is a class of gas carriers developed in the early 2000s by ExxonMobil, Gas Transport-Technigas and Qatargas. Unlike its predecessors, Q-Flex tankers are equipped with 5 shorter and higher membrane tanks of the GTT * system which allows them to carry more cargo without losing stability. 9 287 757 – 9 393 701 cu ft Q-Max tankers repeat the Qatar-Flex tanker design in larger scale. The largest LNG gas carrier today is M / T Pacific Breeze. 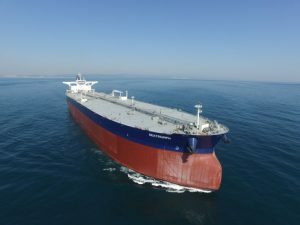 It was launched in March 2018, has a length of almost 300 m (984 ft) and carriers 182,000 m3 (6 427 269 cu ft) of natural gas. The tanker was built by Kawasaki Kisen Kaisha (Japan) to work at the Ichthys gas field in Australia. 1G Type. 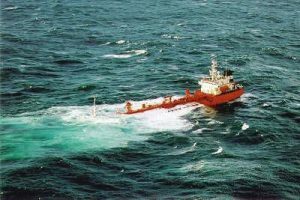 Vessels are designed to carry chlorine, methyl bromide, sulfur dioxide and other gases specified in Chapter XIX of the IGC Code. These gases pose the greatest hazards to the environment, so their transportation requires maximum precautionary measures. 2G Type. These gas carriers transport cargoes that require significant protective measures to prevent gas leakage. 2PG. General type gas carriers. Such tankers have a length of up to 150 meters; and the safety requirements for their tanks are moderate – a pressure of at least 7 bar and a temperature of no more than -55 ° C (-67°F) for the cargo system. 3G Type Gas Carriers can carry cargo with moderate security measures. Tanks design of gas carriers is worth exploring as well. When in contact with cooled and liquefied gas the metal becomes fragile and brittle, so gas tanks are made of expensive alloys such as invar (iron and 36% nickel), nickel steel (9% nickel), chromium-nickel steel (9% nickel, 18% chromium) or aluminum alloys. There are following types of cargo tanks: integral tanks, independent, membrane, semi-membrane and internal insulation cargo tanks. The most widely used cargo containment systems are spherical systems of Moss-Rosenberg and membrane containment systems. Moss-Rosenberg System: The technology was first used at the Höegh plant in Norway for the LNG carrier M/T Norman Lady and dominated until the late 90s. Spherical tanks are built separately and then mounted on the hull and fixed with a metal band along the line of the equator of the tank. Then, a procedure of heat insulation and covering of the tank with a metal body is conducted. Profound insulation and double enclosure ensure safety of the structure; while separate building reduces the cost. However, manufacturers have been favoring membrane systems for a while now since it allows avoiding the problem of cooling a large area of ​​aluminum. Technigaz Mark III – tank casing is made of stainless steel or aluminum wafer panels. CS1 – a combination of the above two systems. GazTransport invar panels are installed as the primary membrane, then 3-layer Technigaz membranes (sheet aluminum between two layers of fiberglass) as secondary insulation. The energy content of LNG inside tanks of modern Q-Flex gas carrier equals 60 bombs dropped on Hiroshima. According to VesselsValue, 5 major shipowner companies in the industry now control up to 20% of all global LNG shipments. The list includes: Qatar Gas Transport Co (or Nakilat), Mitsui OSK Lines, Teekay, Maran Gas Maritime and the NYK Line. Their combined fleet consists of 110 vessels with a total cargo capacity of 19.5 million m3 (688.6 million cu ft). The energy contained in the tanks of two large LNG carriers is enough to boil 4 such lakes as Loch Ness or evaporate water from it completely. LNG carrier usually loses about 0.1% of cargo daily due to evaporation. In 2000s LNG Reliquefaction System had to be installed to reduce transportation losses, but at present it is more reasonable to utilize evaporating gas as a fuel for the vessel itself. The Middle East countries found themselves in the list of LNG importers since despite an active oil and gas production in the region there is no pipeline infrastructure. Therefore, it appeares more profitable for the United Arab Emirates, Kuwait, Egypt, Turkey and other countries to receive liquefied fuel by sea. If the ignition occurs on the gas carrier it will be impossible to extinguish the fire until the cargo will have burned out itself completely. In the event of an explosion of modern gas carrier near the land the impact zone will be 190 km2 (73.3 sq ml). The most serious accident in the industry occurred in November 1974. LPG tanker collided with a cargo ship in the port of Tokyo. This led to the massive explosion onboard, 34 seafarers died instantly. Remains of the tanker which also carried some ligroin were towed out of the bay and drowned with torpedoes launched from a submarine, but an underwater burning continued for 20 more days. Opinions are voiced occasionally that gas carriers may become a convenient target for terrorist attacks. The plot of Syriana movie revolves around a similar scenario. It features a Pakistani terrorist who hijacks and attempts to blast the LNG tanker. George Clooney won an Oscar for the Best Supporting Actor in Syriana in 2005. One of the world’s most impressive ship-to-ship Liquified Natural Gas (LNG) transfers happened on January 2 – 4, 2019 in Turkish port of Dortyol. FSRU Botas is moored there (the world’s largest Floating Storage Regasification Unit). Botas is 345 meters (1132 ft) long and stores 263,000 m3 (9 287 757 cu ft) of natural gas. A 315-meter (1034 ft) Al Sadd supertanker approached FSRU with LNG cargo (206,000 m3) (7 274 821 cu ft) from Qatar. It took 2 days to pump over the gas from the LNG carrier. FLNG Shell Prelude is the largest floating object in the world. It is a floating complex for the production, processing, storage and offloading of natural gas in the sea. The length of its deck is 500 meters (1640 ft or 4 soccer fields), 74 m wide (243 ft), and 100 m (328 ft) high. The giant was built to develop hard-to-reach gas fields 200 km (124 ml) off the coast of Western Australia and will produce 5.3 million tons of LNG per year. There are only 1,800 gas carriers in the world today, but their share is growing steadily. Gas tends to replace oil as an efficient source of energy; and the market share of companies specializing in gas production, transportation and processing is ever expanding. 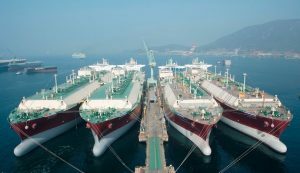 A massive market research called Global Liquefied Natural Gas (LNG) Tankers Market Insights 2019-2025 was recently published. It details further development of the industry for the coming years. According to it, the world consumes 330 billion m3 (11,7 trn cu ft) of gas per year and this figure increases by 7.5% per annum. Thus, gas carriers and all those who work on them have good prospects.